LIDAR (LIght Detection And Ranging) is a powerful remote sensing tool that hat provides high resolution, three dimensional, spatial information about the land. So, it can be used to focus on applications requiring position or location, including agriculture. Unfortunately, the LiDar expected to revolutionize the way has seen little use in agriculture due to the current cost structure. Some developed countries have to commence a programme to cover the entire mainland states with LIDAR and provide free access to the data for the public via the internet. The output from a LIDAR survey is a point cloud where every point has an x, y and z coordinate together with range and re­flectance val­ues. Other attributes can be calculated (height above ground) and RGB colours for every point can be merged from aerial photography using drones. LiDAR technology is one of the most advanced and most accurate technologies that measures distance to a target by illuminating the target with pulsed laser light and measuring the reflected pulses with a sensor. LiDAR technology applies to various industries that professionals rely on this new technology to produce results. One such industry is agriculture. LiDAR is used extensively for various reasons in the agricultural sector. There are a wide va­ri­ety of LiDAR usage for agriculture listed below. 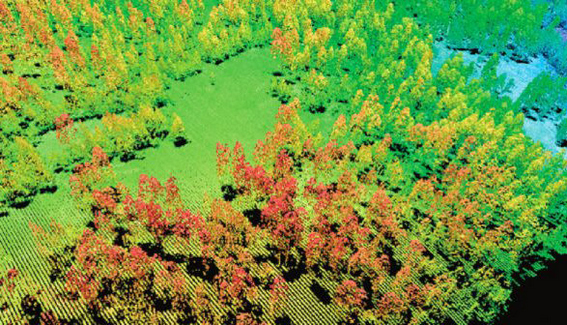 LiDAR technology is instrumental in developing 3D models of a farm land and forestry in 3D vegetation models. It helps come up with crop planning and incredible accurate maps of the natural resources. With this data, the farmer can then be able map the water flow, discern the exact terrain of the farm, locate all the trees in an orchard, and define the water catchment area and the flow of erosion. Capabilities of LiDAR technology give farmers new ways to collect and analyze data about soil type and soil content that a certain farmland has. This information is important to the farmer because it helps them to determine the suitability of crop production that can be grown on that farm and what fertilizer should be applied. In several cases, they have been able to understand why certain types of soil do not lead to much crop yield and then they use this data to do the best possible farming practice. LiDAR technology can be used for planning and management of agriculture. 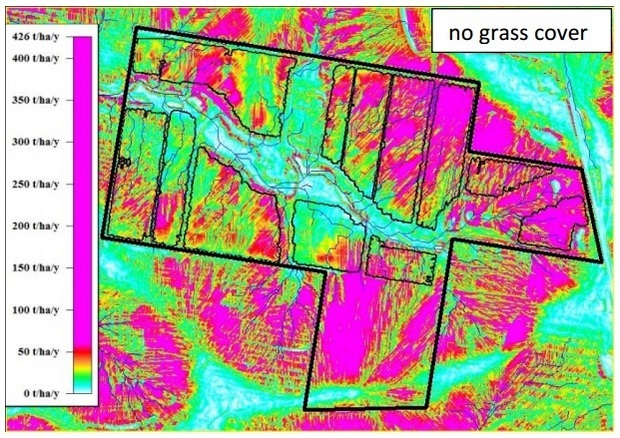 Using the output of LiDAR survey, the farmer can be able to know the suitability of land for a particular farm site and the best time to plant. So they can pay attention the extent crops to increase the productivity of this site. LiDAR data can also be used to map large areas and come up with the exact design and map of the land more efficiently. This data provides an up-to-date shape and terrain of the farmland. With this data, farmers will be able to know what to plant, how to plant crops on that farmland, and how healthy the plants are. 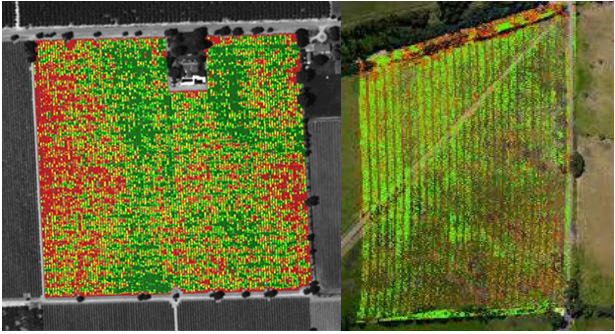 Another important use of LiDAR in agriculture is crop yield forecasting. This data generated by this LiDAR technology helps farmers know the suitability of a particular crop on a given land based on the expected equity returns of the yields at the end of the season. LiDAR technology can also been used to interpret land segmentation. Through LiDAR technology, experts have been able to analyze the data to show the land patterns and use the information to segment the land for different uses. LiDAR can also be used to provide general crop analysis and determine the suitability of the crop to thrive in a particular farmland. This analysis is important to the farmer to estimate the crop quality and measure this against the ideal standards. LiDAR can help de­ter­mine where to apply costly fer­til­izer. It can cre­ate a topo­graph­i­cal map of the fields and re­veal slopes and sun ex­po­sure of the farm­land. Re­searchers at the Agri­cul­tural Re­search Ser­vice used this topo­graph­i­cal data with the farm­land yield re­sults from pre­vi­ous years, to cat­e­go­rize land into zones of high, medium, or low yield. This in­di­cates where to apply fer­til­izer to max­i­mize yield. Another advantage usage of LiDAR is field management services. These may include services like water flow mapping and the amount of water management required to irrigate or how many times in a year a crop should be planted on a given farm area. Another application of LiDAR technology can also be used to control the overall crop yield in orchards and vine­yards. It helps to de­tect fo­liage growth and the need for prun­ing or other main­te­nance. This can be done through precision agriculture where farmers can detect vari­a­tions in fruit pro­duc­tion, or count plants. And then, they can implement measures to increase the overall yield. LiDAR can also help experts in identifying potential production zones in an area. The data collected through this technology can help select an area in your farm land where production is likely to be higher than the rest of the land. Knowing how to identify and control weeds re­quires iden­ti­fy­ing plant species. This can be done by using 3-D LiDAR and Ma­chine Learning (ML). LiDAR pro­duces plant con­tours as a "point cloud" with a number of attributes such as classification, intensity, scan angle, return number, etc. This data is trans­formed, and fea­tures are ex­tracted from it. If the species is known, the fea­tures are added as new data. The species is la­belled and its fea­tures are ini­tially stored as an ex­am­ple to iden­tify the species in the real en­vi­ron­ment. This method is ef­fi­cient be­cause it uses a low-res­o­lu­tion LiDAR and su­per­vised learn­ing. It in­cludes an easy-to-com­pute fea­ture set with com­mon sta­tis­ti­cal fea­tures which are in­de­pen­dent of the plant size. LiDAR technology can be used to detect the extent to which crops in farming area have been damaged and the cause of the damage. This early detection can help farmers come up with mechanisms to prevent the damage and give farmers new ways to increase yields. Soil erosion is a widespread environmental problem due to landscape features facing many farmers today. Maps of soil erosion risk can be generated using LIDAR and the RUSLE (The Revised Universal Soil Loss Equation). LiDAR technology has been instrumental in minimizing the impact of soil erosion through 3D mapping and modeling of a given farmland. By getting the exact terrain of the farm and knowing the contours of a farm and the variations in slope, farmers are able to come up with preventive measures to reduce or eliminate soil erosion that causes both on-farm and off-farm problems. Thus, there is a clear benefit in using LIDAR for agriculture. There are a wide variety of benefits in having accurate digital farm maps including crop planning and management. LiDAR is use­ful in GPS-de­nied sit­u­a­tions, such as vine­yards and fruit or­chards, where fo­liage blocks GPS sig­nals to pre­ci­sion agri­cul­ture equip­ment or a dri­ver­less trac­tor. LiDAR sen­sors can de­tect the edges of rows, so that farm ­machinery can con­tinue mov­ing until GPS sig­nal is reestab­lished. 2 Responses to "Advantages of LiDAR Usage for Agriculture"
It's a very interesting and informative post. You just talk about a fabulous technique lidar scanner, Denver, Colorado.. It's an awesome way to describe all the things. It you want use it for your project, try them.